© Kirill Kudryavtsev/AP National Security adviser John Bolton attends a wreath laying ceremony at the Tomb of the Unknown Soldier by the Kremlin wall in Moscow on Oct. 23, 2018. National security adviser John Bolton held firm Tuesday to President Trump’s announcement that the United States would withdraw from a landmark arms control treaty in place since the Soviet era. Bolton said the United States would present “in due course” an official notice leaving the treaty limiting intermediate-range nuclear weapons. 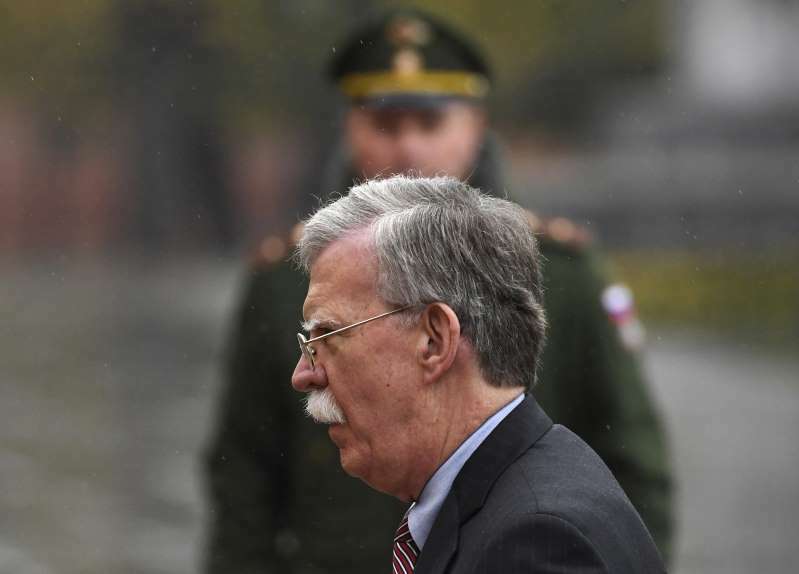 He also echoed Trump’s assertions that Russia is violating the pact, suggesting that no progress was made to ease the impasse during Bolton’s two days of talks with top Russian officials including President Vladi­mir Putin. Bolton’s comments seemed sure to disappoint Germany and other U.S. allies in Europe that have urged Washington to work to overcome disputes with Russia rather than walking away from the treaty entirely. The Kremlin denies any violations and says scrapping the 31-year-old Intermediate-Range Nuclear Forces Treaty, or INF, would be a dangerous development that could spark a new arms race. President Ronald Reagan and Soviet leader Mikhail Gorbachev signed the INF Treaty in 1987, leading to the elimination of an entire category of nuclear missiles and the removal of more than 2,500 of them from installations across Europe. Since the Obama administration, U.S. officials have said Russia’s development of a ground-launched missile is skirting INF rules. In a bit of dark humor that underscored the moment, Putin referred to Washington’s announced withdrawal from the INF and then quipped about the balance between peace and force represented by the Great Seal of the United States. “That’s what I thought,” Putin said, provoking laughter from Bolton. Bolton’s mission waded deep into the frictions between Washington and Moscow, while leaving open the question of what, if any, arms-control architecture the Trump administration envisions for the future. Bolton described the Cold War-era treaty as outdated because it does not include other nuclear powers, including China. But he suggested it was unrealistic to include other countries in a broader version of the INF Treaty, saying at the news conference that such efforts had failed in the past. Putin and Trump will meet in Paris in November on the sidelines of the 100th-anniversary celebration of the end of World War I, Bolton said. Beyond arms control, he described a range of issues on which Washington was looking to engage with Russia, including the war in Syria, fighting terrorism and election interference. Bolton said he also briefed Putin on the U.S. response to the slaying of Washington Post contributing columnist Jamal Khashoggi at the Saudi Consulate in Istanbul on Oct. 2. Bolton deployed the symbolism of wreath-laying to both signal respect for Kremlin authority and to show criticism of repression of the political opposition in Moscow. He laid a wreath at the Tomb of the Unknown Soldier at the Kremlin wall. He did the same at the unofficial memorial just outside the Kremlin wall marking the spot where opposition politician Boris Nemtsov was killed in 2015. Bolton’s visit to Moscow was his second in his role as Trump’s national security adviser, signaling the administration’s intention to maintain contact with Russia despite the uproar in Washington over its interference in the 2016 election.